This recipe is from my grandma. 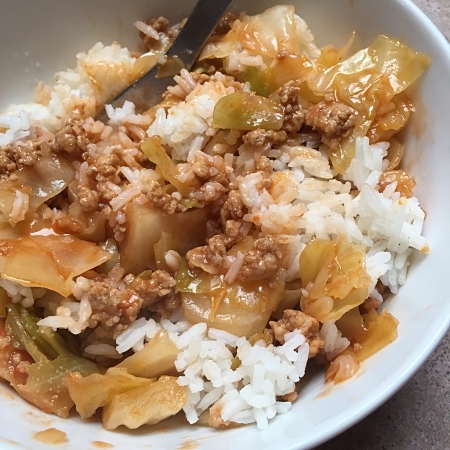 It has very few ingredients, but it tastes AWESOME--just like stuffed cabbage, only without all the work. You can eat it as-is, or serve it over rice, which is my favorite way to eat it. Remove the core from the cabbage and coarsely chop the whole head (I usually do about 1" by 1" pieces. In a skillet, heat the oil and cook the turkey and onion in oil until the turkey is browned and onion is soft. Spread half of the raw chopped cabbage into a large casserole dish. Cover with the meat mixture. Top with the remaining cabbage (you may have to pack it down--it looks like a TON of cabbage, but it shrinks down a lot while cooking). Pour tomato soup over the top (don't add liquid to the soup--just use it straight out of the can), and spread it around. Sprinkle with salt and pepper. Don't stir it together--just leave it in layers. Cover the dish and bake at 375 degrees for 1 hour to 1 hour and 15 minutes (more or less, depending on how soft you like the cabbage to be). When it's done, stir it all together. Serve over rice.